The first of several movies intended to reveal the origins of different X-Men characters – and which are, in effect, prequels to the enormously popular X-Men franchise – Wolverine is an action/adventure which follows the fortunes of James Logan (Hugh Jackman), born in the Pacific Northwest in the late 1800s with mutant powers of regeneration; along with his half-brother Victor (Liev Schreiber), Logan fights in the American Civil War, WWI, WWII and Vietnam, using his powers to stay alive, until he is approached by US Army Major William Stryker, who has recognized Logan and Victor’s abilities, and wants them to join his elite mutant commando group. However, Logan quickly realizes that his powers are being exploited, and deserts his Unit, hiding in a remote part of Canada with his girlfriend Kayla; unfortunately for Logan, he soon learns that his past won’t leave him alone. The film is directed by Gavin Hood and co-stars Danny Huston, Dominic Monaghan, Ryan Reynolds and rapper William Adams. 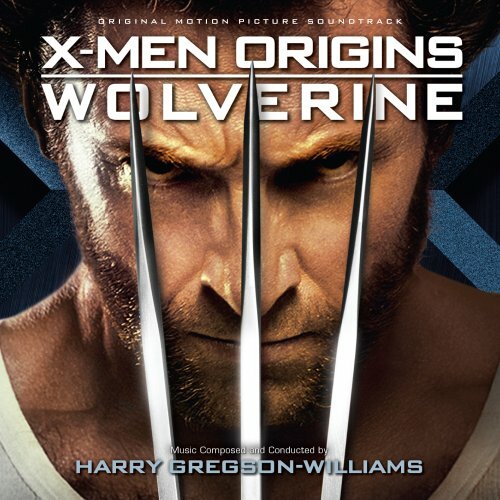 It also has an original score by Harry Gregson-Williams, who becomes the fourth composer to tackle the X-Men series after Michael Kamen, John Ottman and John Powell. Gregson-Williams tackles Wolverine in much the same way as many of his contemporaries have with other super heroes; a big orchestra and choir, overlaid with lots and lots of electronics to appeal to the demographic masses. The main theme for Logan, as heard in the opening “Logan Through Time”, is a low, heroic 7-note brass theme that appears frequently throughout the score, and when he accompanies the theme with a strong mixed voice choir, he gives the main character a powerful sense of destiny; this theme is one of the good things about the score, and when it appears at the core of later cues such as the exciting “Adamantium”, the spooky “To the Island”, and the conclusive “I’ll Find My Own Way”, the score sounds good. Unfortunately, for far too much of the score’s running time, he smothers his decent thematic writing with layer upon layer of harsh synthetic rhythms and grating industrial textures that, while probably appealing to the masses, annoyed me intensely. And it’s regrettable, because some moments of the score are really quite excellent. The Zimmer-style humming chorus and militaristic snares at the end of “Lagos, Nigeria” is self-sacrificing and dignified; the touching love piano and string theme for Logan and Kayla is heard at its best in “Kayla”, and gets a tragic re-airing at the culmination of “Victor Visits”. The majority of the actual action music, however, tends to be of the same mould that Gregson-Williams employed in scores like Enemy at the Gates, Man on Fire, Spy Game, and others, and just churns on relentlessly, being little more than electronic pulses and repetitive orchestral chords. Cues like “Special Privileges”, “Wade Goes to Work”, “Logan Meets Gambit” and “Deadpool” more often than not made my head hurt, which is a shame because there are some interesting orchestral dissonances and rhythmic devices buried beneath all the mud. It’s disappointing, because although none of the previous X-Men scores were truly outstanding, Gregson-Williams has the chops to deliver something a less conservative and predictable than a modern hybrid score that never really develops much beyond being just ‘OK’.